Heilongjiang (aka Heilungkiang) is located in the northeastern part of China. "Heilongjiang" literally means Black Dragon River, which is the Chinese name for the Amur. The one-character abbreviation is Hei. The Manchu name of the region is Sahaliyan ula (literally, "Black River"), from which the name of Sakhalin island is derived. Heilongjiang borders Jilin in the south and Inner Mongolia to the west; it also borders Russia to the north. The Amur River marks the border between the People's Republic of China and Russia to the north. Heilongjiang contains China's northernmost point (in Mohe County along the Amur) and easternmost point (at the junction of the Amur and Ussuri Rivers). In ancient times Heilongjiang was far from any literate civilization, and information was sparse. Chinese and other sources state that Heilongjiang was inhabited by people such as the Xianbei, the Malgal, and the Khitan. The eastern portion of Heilongjiang was ruled by the kingdom of Balhae between the 7th century and 10th century. The Jurchen Jin Dynasty (1115-1234) that subsequently ruled much of north China arose within the borders of modern Heilongjiang. Heilongjiang and Jilin Provinces on a 1734 French mapHeilongjiang as an administrative entity was created in 1683, during the Kangxi era of the Manchu Qing Dynasty, from the northwestern part of the Jilin province. This Heilongjiang Province only included the western part of today's Heilongjiang Province, and was under the supervision of the General of Heilongjiang (the title is also translated as the Military Governor of Heilongjiang), whose power extended, according to the Treaty of Nerchinsk, as far north as the Stanovoy Mountains. The eastern part of what's today Heilongjiang remained under the supervision of the General of Jilin, whose power reached the Sea of Japan. These areas deep in Manchuria were closed off to Han Chinese migration. In 1858 and 1860 the Qing government were forced to give up all land beyond the Amur and Ussuri Rivers to the Russian Empire, cutting China off from the Sea of Japan and giving Heilongjiang its present northern borders. At the same time, Manchuria was opened to Han Chinese migration by the Qing government. By the early twentieth century, the Han Chinese had become the dominant ethnic group in the region. In 1932, present-day Heilongjiang became part of the Japanese puppet state of Manchukuo. After the Japanese defeat in 1945, Soviet forces entered Manchuria and gave the Chinese communists control over most of the area. Heilongjiang became the first province to be completely controlled by the Chinese communists and Harbin the first major city to be controlled by them. From Manchuria, the communists were able to conduct the initial phases of the Chinese Civil War. At the beginning of communist rule, Heilongjiang province included only the western portion of the present-day province, and had its capital at Qiqihar. The remaining area was the province of Songjiang; its capital was Harbin. In 1954, these two provinces were merged into present-day Heilongjiang. During the Cultural Revolution Heilongjiang was also expanded to include Hulunbuir League and some other areas previously in Inner Mongolia; this has since mostly been reversed. Heilongjiang is a land of varied topography. Much of the province is dominated by mountain ranges such as the Greater Khingan Range and Lesser Khingan Range, Zhangguangcai Mountains, Laoye Mountains, and Wanda Mountains. The highest peak is Mount Datudingzi at 1690 m (5545 ft), located on the border with Jilin province). The Greater Khingan Range contains China's largest remaining virgin forest and is an important area for China's forestry industry. The interior of the province, which is relatively flat and low in altitude, contains the Muling River, the Naoli River, the Songhua River, the Nen River, and the Mudan River, all tributaries of the Amur's basin, while the northern border forms part of the Amur valley. Xingkai Lake (or Khanka Lake) is found on the border with Russia's Primorsky Krai. Heilongjiang is subarctic in climate. Winters are long and frigid, with an average of -31 to -15°C in January, and summers are short and cool with an average of 18 to 23°C in July. The annual average rainfall is 500 to 600 mm, concentrated mostly in summer. Harbin, the provincial capital, is a city of contrasts, with Chinese, Russian, and eclectic worldwide influences clearly apparent. Eastern Orthodox, Roman Catholic, and Protestant churches dot the city. The long, cold winter is the backdrop for its famed ice sculpture exhibitions. 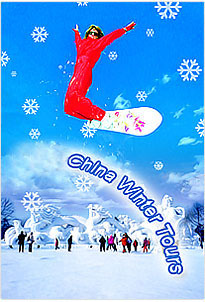 In 2007 already the 8th Ice and Snow World opened to visitors in Harbin. More than 2000 ice sculptures were on display at the annual event. Wudalianchi Lakes are a series of five lakes formed between 1719 and 1721 when volcanic eruption shaped one section of a tributary of the Amur into five interconnected lakes. The second lake in particular is renowned for its irregular geological sights. Lake Jingbo, in Ning'an County, is a section of the Mudan River that has been narrowed and shaped by volcanic eruption into a series of sights, including the Diaoshuilou Falls.